This Bangladeshi beef shatkora recipe is a dish of contrasts. 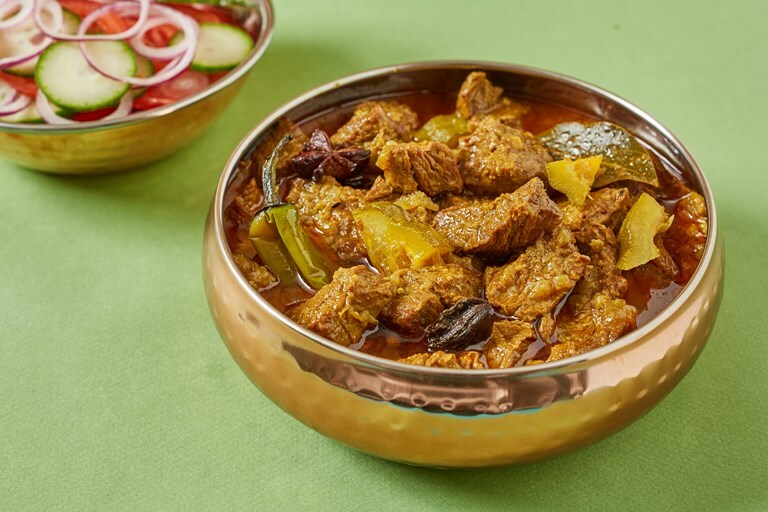 Rich spiced beef is balanced with the sour bitter flavour of the shatkora, a type of citrus fruit grown in the country. A stunning curry typically eaten during autumn. If you can't find shatkora (sold fresh and frozen in Bangladeshi grocery shops), it can be replaced with the same amount of grapefruit or pomelo. For more incredible and authentic Bangladeshi recipes, see Dina's feature. Beef shatkora is one of my favourite things to eat and a staple dish from the Sylhet region of Bangladesh, where I was born. Pieces of beef on the bone are slowly cooked with aromatic and earthy spices (such as black cardamom, star anise and cinnamon) and lifted with the prized shatkora, a fragrant, bitter and slightly sweet citrus fruit commonly used in Sylheti dishes. The shatkora has a knobbly texture and resembles a lime; however, unlike other fruits from the citrus family, it’s only used to cook with due to its intense and bitter taste. You can usually find fresh shatkora in Bangladeshi grocery stores or in the freezer section, sliced into wedges. Serve it with glutinous rice or boiled white rice and a salad of cucumber, tomatoes and red onions.